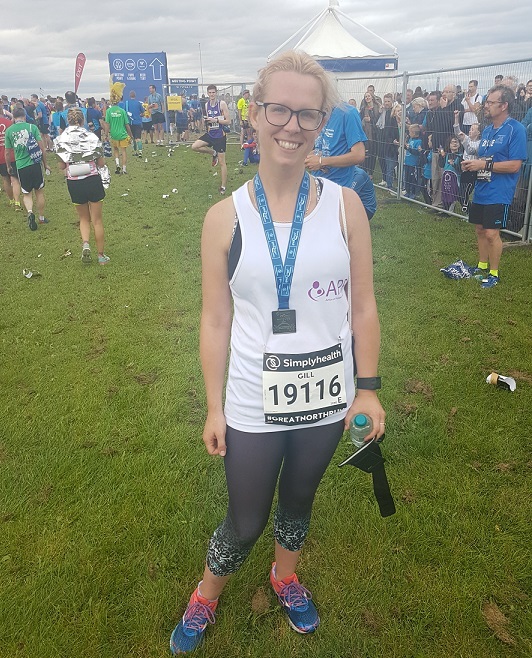 Gill completes the Great North Run! A very BIG THANK YOU to Gill Wood for successfully completing the Great North Run on 10th September, in aid of APP! We are so grateful to Gill and to everyone who donated and supported her along the way - and you can still donate via her Just Giving page here. 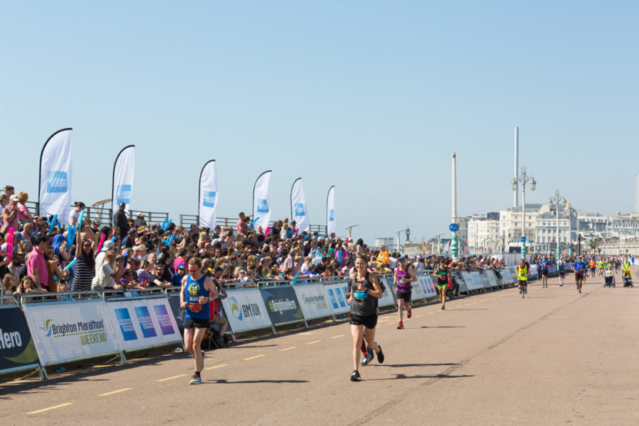 ...and if you're interested running the Great North Run next year (9 Sept 2018) then why not sign up to their reminder service and they'll send you an email as soon as the ballot opens! Thank you to the fundraisers of Derby! Warm thanks go to all those who donated items for a recent quiz & pop-up shop at The Leopard in Tutbury, also to the ladies at Helping Hands from Swadlincote who utilised all the remaining pop-up shop items at another table top sale for APP and finally to Alex and Heather Heron who hosted an annual barbeque (with blow up assault course!) for MVH Triathlon club at "Hoon Ridge" at the end of August. "Great evening at Hoon Ridge even though the weather forced folks inside for some of the time. That said, it did not daunt those competitive types who wanted to win the massive, blue blow-up assault course race." The combined total raised for APP was £720. Wonderful support from all of our APP friends! Thank you so much. Two marathon runners on the same day! 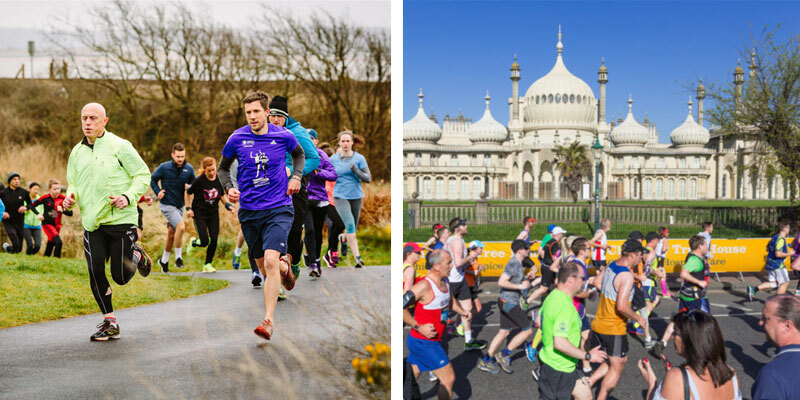 APP have two fantastic supporters who are running two rather different marathon events in aid of APP, which are both taking place on the very same day - Sunday 15th April 2018! Please support Catherine's fundraising and visit her Just Giving page here. Please donate what you can, and support Nicholas on his Just Giving page here. A very BIG Thank-You to both Nicholas and Catherine for undertaking their marathon challenges in aid of APP, we are very grateful for your support! 6 down, 6 to go - Holly reaches half-way! 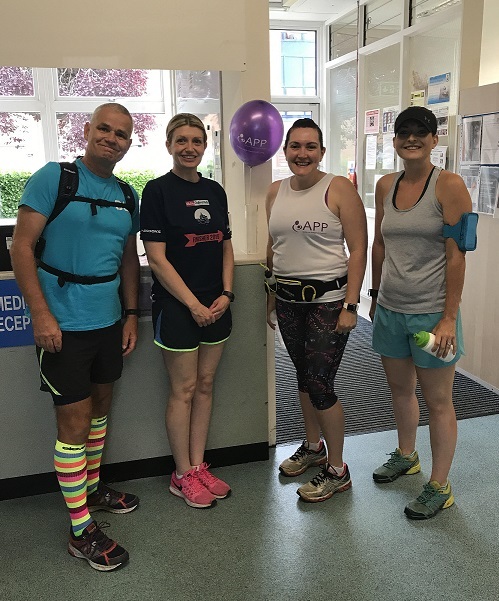 A big CONGRATULATIONS to Holly Haywood who has reached the half way point in her challenge of completing 12 marathons in 12 months in aid of APP! 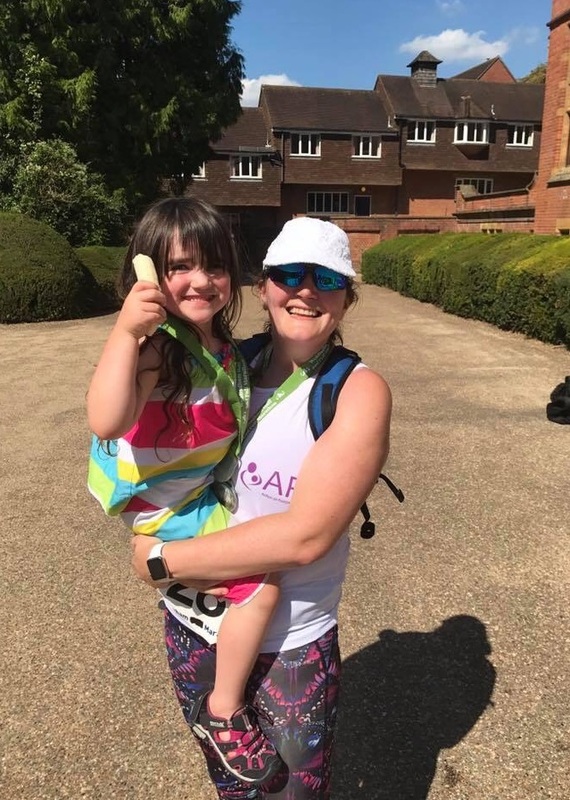 We can't thank Holly enough for taking on this enormous challenge in aid of APP, especially battling through the heat in order to reach her half-way point, what an achievement already! Please donate what you can to support Holly's amazing challenge via her Just Giving page here. Gill Wood to run the Great North Run! 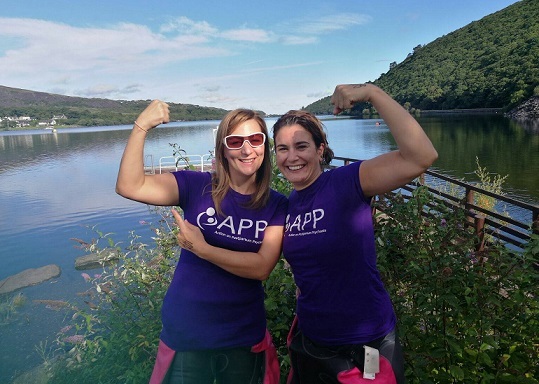 A big thank you to Gill Wood who is taking on the challenge of the Great North Run, the largest half marathon in the world, on 10th September in aid of APP! 'Nearly a year ago to the day I was discharged from a mum and baby unit in Morpeth with baby Jack. I'd been there since he was 2 weeks old. We always knew there was a chance I'd get poorly as I unexpectedly became very poorly with postpartum (after birth) psychosis after we had Megan 12 years ago, hence us waiting so long for Jack! 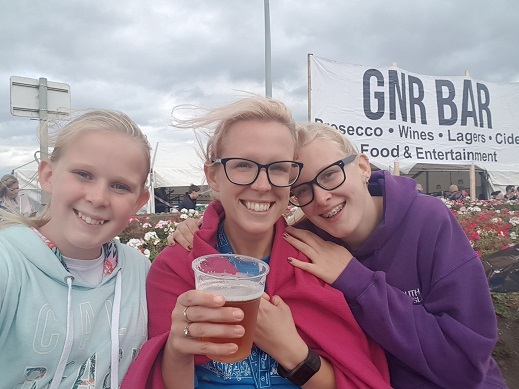 Please support Gill in her Great North Run, you can donate via her Just Giving page here. A big thank you to Gill, and wishing you the very best of luck for 10th September! APP Charity of the Year for Bradford Midwifery Society 2017-18! 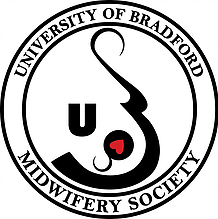 APP are delighted to announce that we have been chosen to be University of Bradford Midwifery Society's Charity of the Year for 2017-18! The University of Bradford Midwifery Society was established to support and unite midwifery students and professionals, and create a dynamic and energetic forum for shared learning and development. They say: 'The impact of the society continues to grow momentum, creating a global village that empowers its individuals. This strength and passion leads to greater advocacy for women; best practice and informed choice; and committed and compassionate care for all. We are told the first event in the diary will be Freshers Week, where they recruit their newest cohort to the midwifery society - you can find out more via their website here, or on their Facebook and Twitter pages. 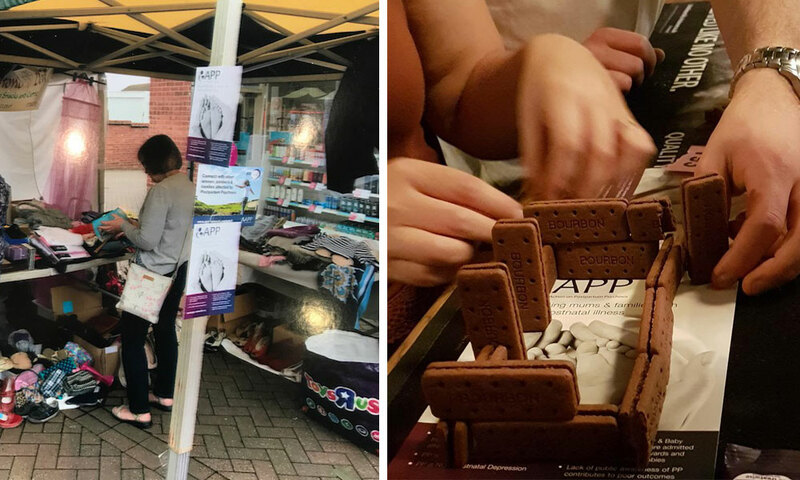 APP are really thrilled to have been chosen as their Charity of the Year and we can't wait to get involved with all their events and activities throughout the next twelve months...watch this space! Rik & Hannah running the Barns Green Half on 24 September! 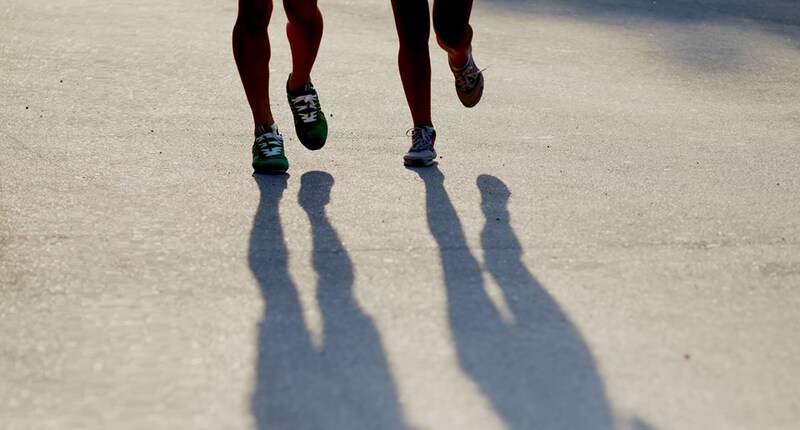 A big Thank You to Rik & Hannah who are preparing to run the Barns Green Half marathon on 24th September, in Horsham, West Sussex in aid of APP! The Barns Green Half is run on closed roads through the beautiful West Sussex countryside, passing through the historic Christ’s Hospital school, where the School’s famous marching band will be playing. They say 'we also have a jazz band at the start/finish and four other bands along the route, where there are water stations, distance markers, marshals and of course the support of all the locals and spectators.' 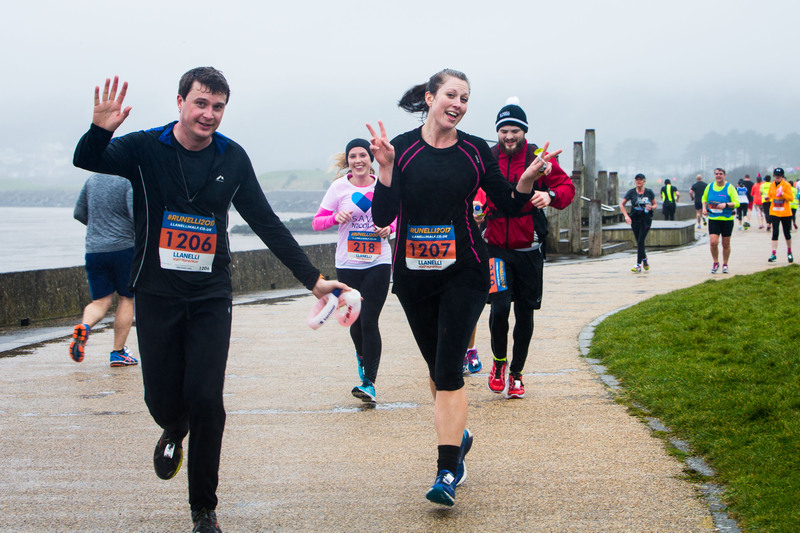 It sounds like quite a fun, music filled half marathon event! Rik and Hannah are already busy fundraising and would be grateful for extra support, so, please dig deep if you can, and donate via their Just Giving page - wishing you both the best of luck for 24th September, let's hope it stays sunny! 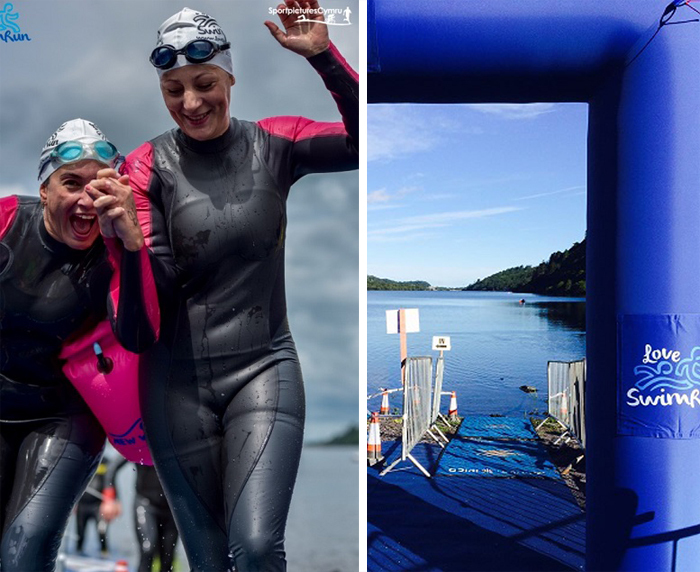 Sally & Ruth's £3k for 3K at Big Welsh Swim! 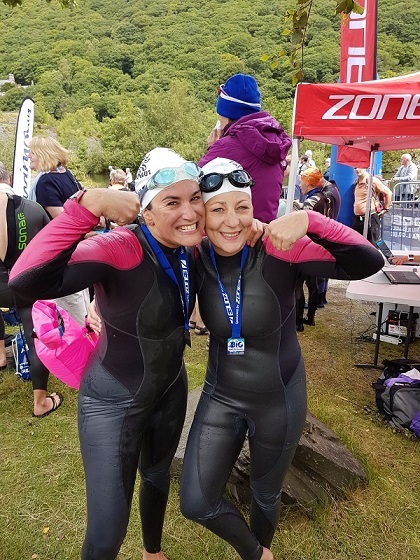 A very big congratulations and thank you to Sally and Ruth who completed the 3k Big Welsh Swim last Saturday, 22nd July! They lucked out with the weather, with a beautifully sunny day at Lake Padarn, North Wales. Some very happy smiley faces, after completing their 3k swim! They have already raised over £2,500 and their Just Giving page is still accepting donations - please support them and give what you can. Congratulations to you both, a great achievement! Thank you from us all at APP. APP Quiz and Pop-Up Shop in 'The Leopard' Tutbury! 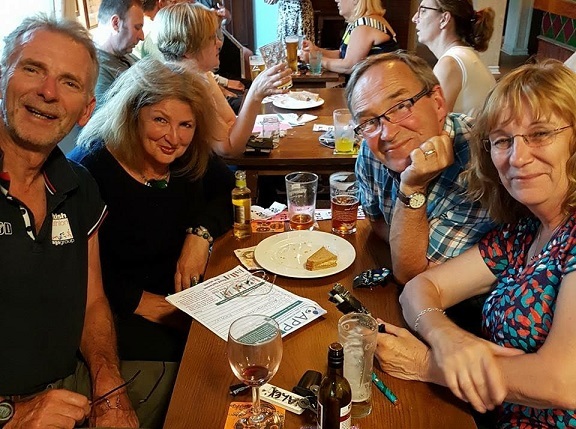 Wednesday 5th July saw some of APP’s volunteers suffer the indignity of coming last in yet another pub quiz! Whatever: the night went with a swing for APP in other ways. 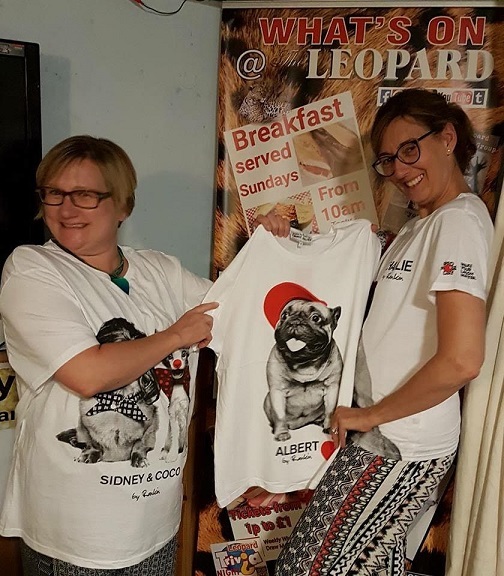 We are greatly indebted to The Leopard’s landlady, Karen (Kaz) Maclean and her big-hearted family for all the hard work which they put into such a successful and fun event - raising APP’s profile in the Midlands and £400 for our funds. 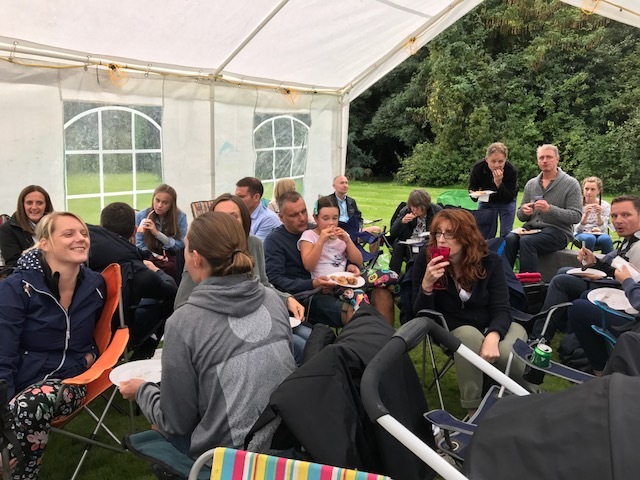 Kaz provided all the food for free, she set up a nearly-new pop up shop, contributed quiz and raffle prizes and hosted the entire night with aplomb. It was an unusual quiz. 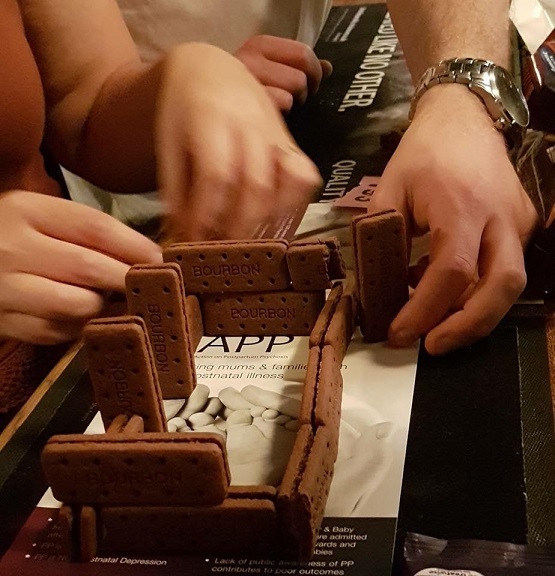 Picture each team trying to build a house with Bourbon biscuits and a large bar of chocolate or wandering around the pub looking for things beginning with “p”…. Hmmm, yes - rude in parts! I should like to thank all those who provided items for the pop-up shop, quiz and raffle and all those who supported us, especially Elaine Williams who promoted us in Tutbury and did so much more besides. If you are ever in Tutbury, visit "The Leopard"; a small but warm community pub, with a lovely family at its helm and a charitable core at its heart. 12 marathons in 12 months to celebrate Leo and his mum! Nov 5th, 2017 is little Leo's birthday. His aunt, Holly Haywood, has set herself a massive challenge: to run 12 marathons in 12 months. 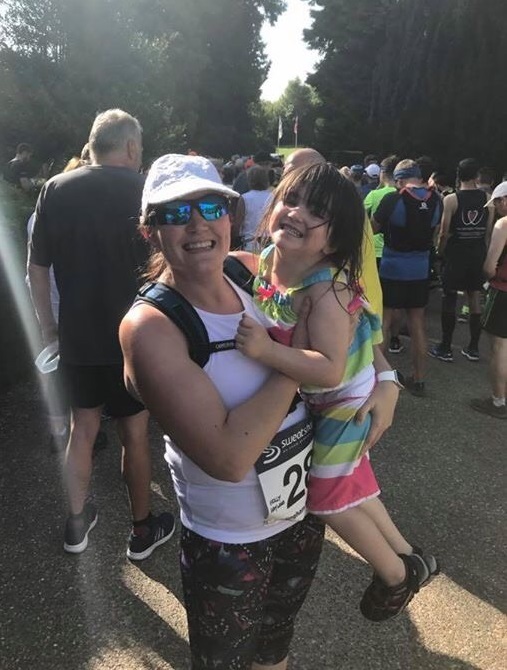 Holly reasons that if her sister can pull through the shock and heartache of PP then surely she, too, can climb this marathon "mountain" in aid of APP but also in celebration of her brave sister and little Leo. 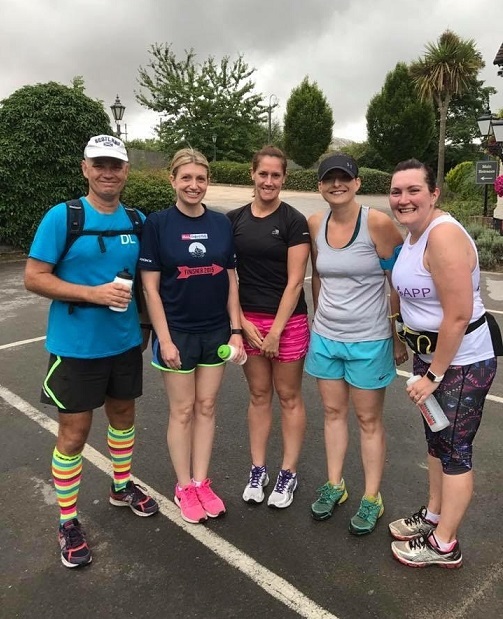 Holly has already completed The Thames Marathon, The Brighton and The Exeter Marathon and has just completed her fourth marathon where she was joined along the way by some of her colleagues. ‘3 of us set off at 09:00 and the first half marathon was completed in 2 hours 30mins. We mainly ran on rural roads and along the beautiful Basingstoke canal. The weather was perfect, overcast and cool. The second half we were joined by two more colleagues, this half was more hilly and the legs were not enjoying it as much! At the half way point joined by Vicky and Tara. 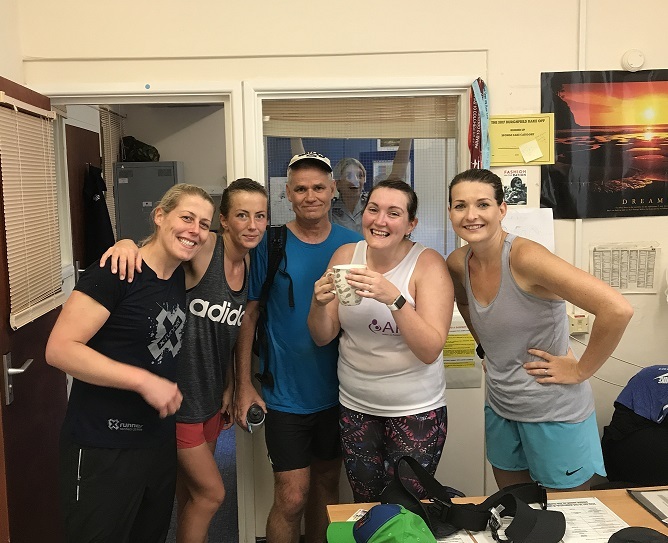 Fortunately colleagues have offered to run with Holly for varying distances, on her next two local marathons (the next one taking place on 1st August), in order to support this valiant effort. Then she will be halfway there! No pressure! 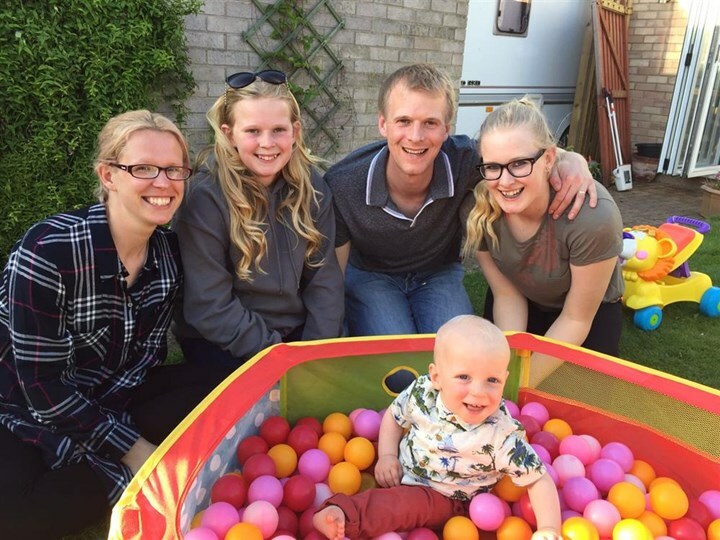 Holly is hoping to complete all 12 marathons in time for Leo's birthday on 5th November, and here's hoping Holly's page receives the sponsorship it deserves by little Leo's next birthday! A very big Thank You to Holly and all her supporters!